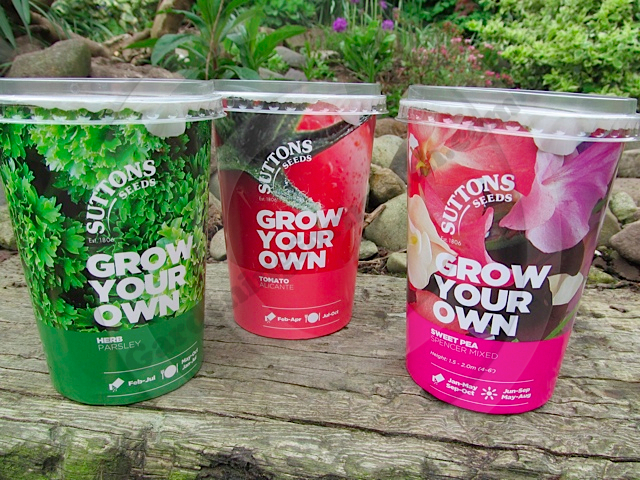 Whilst mooching around the garden centre as one does on a bank holiday weekend, we spied these large yogurt pot style container growing kits from Suttons. A novel idea for a present or perhaps an easy way to grow some window herbs or bring on some tomato seeds! At 97 pence a pot they come in cheaper than a standard packet of seeds and although there are fewer seeds than normal, there are still plenty to achieve a number of plants. The pot claims a “superior germination guarantee”. Each pot contains a 7cm plant pot filled with compost and a packet of seed. The container itself makes a neat miniature greenhouse to bring on your seedlings. The seedlings will need planted out or potted on to reach maturity. Remove the plastic lid and peel of the inner seal to reveal the pot of compost and seeds. Take out the seed sachet and stir the compost to loosen slightly. Take out a little of the compost and set aside to cover the seeds. Open the seed sachet and spread seeds out over the compost evenly and then cover with the remaining compost which you set to one side. Firm the compost and water gently. Place the clear lid on the pot and leave in a warm, light and airy location. 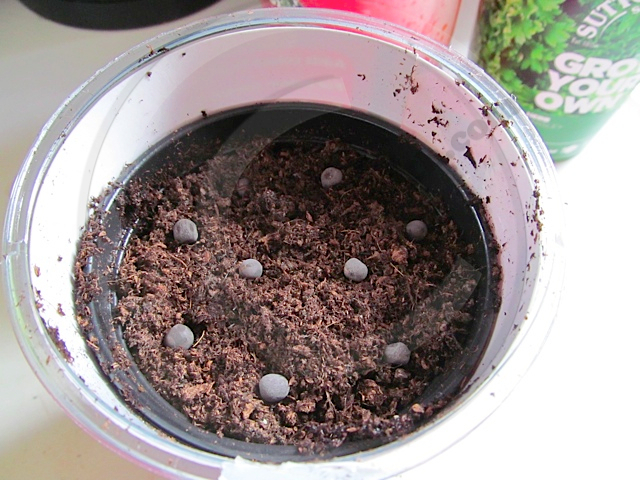 Germination should take about 10 – 20 days, removing the lid once the seedlings appear. When seedlings reach 5cm high, gently prick out and transfer to 10cm pots. Grow on and acclimatise to outside conditions before planting in a sunny position 15cm apart. Support plants as they grow with twigs or canes and keep moist. Cut flowers regularly to encourage more to grow. Sweet peas can be sown as late as April/early May and parsley most of the year round, so we are trialling the Spencer sweet peas and parsley and will let you know how we get on. Ideally sweet peas should be sown indoors around February or March but I think these will catch up with the other direct sown plants as the May weather warms. It is much too late in the year to sow the tomatoes as these require a very long growing season, however, the pack states that the seeds should be sown by December 2013, so we will leave these until about February next year. If someone is new to gardening these kits are complete with everything needed to start off young plants and indeed the parsley and coriander can be left in the pot to grow on as a window herb in the kitchen. The range is limited, but this may be just a trial or something unique to Dobbies Garden Centres. The price is certainly in line with buying a packet of seeds so to have everything in one pot is good value for money. Children seem to naturally take to growing things and these pots would make a wonderful introduction to gardening with perhaps the sweet peas and sunflowers being favourite, as they are quite quick to grow. The pot itself provides incentive with it’s colourful design and promise of what is to come. These Grow Your Own pots would be a welcome gift for any gardener, experienced or novice. Although we were unable to find any information relating to these kits on the Suttons website, you can find out more about their full range and the similar Kids’ Fun to Grow range.